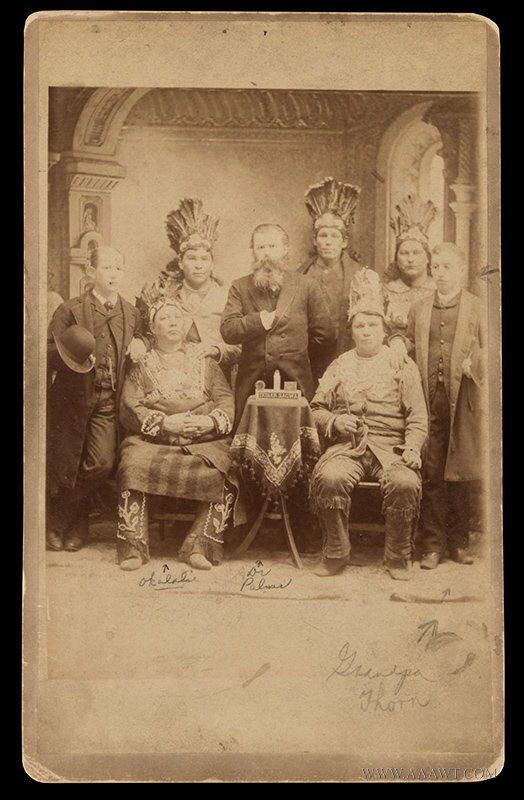 Cabinet Card, Indian Medicine Show, Sagwa; Cure All Product! 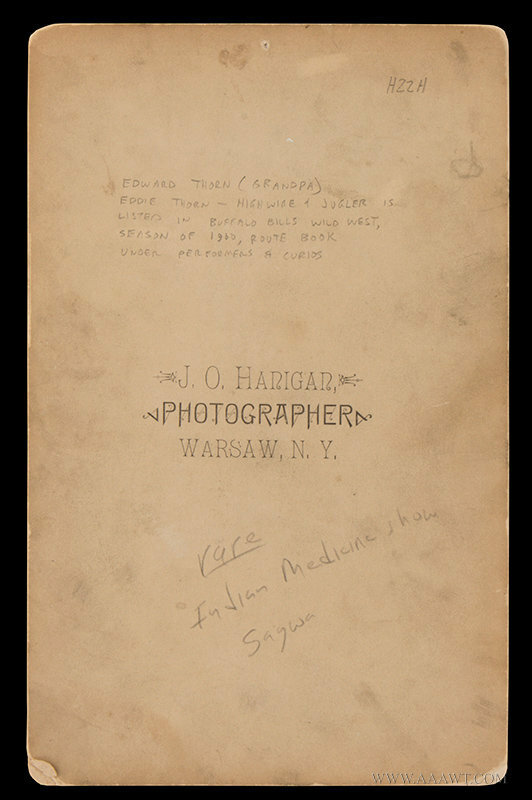 Back marked, J. O. Hanigan / Photographer / Warsaw, N.Y. 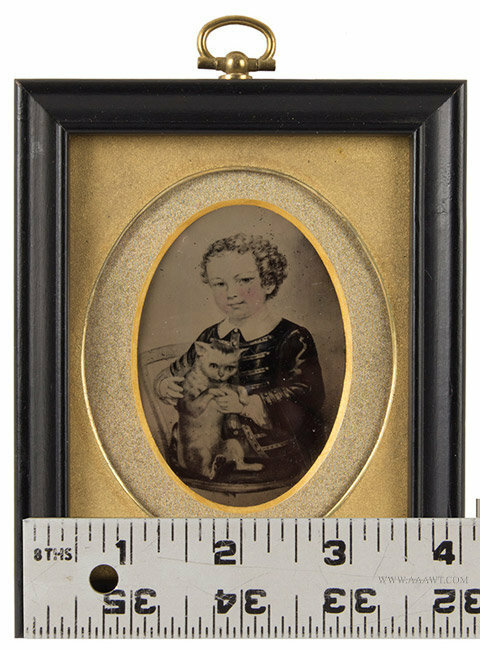 The card is inscribed on verso: "Jacob Lindenberger taken from a miniature which was painted in London Eng in 1804, when he was about 23 years of age." Excellent. 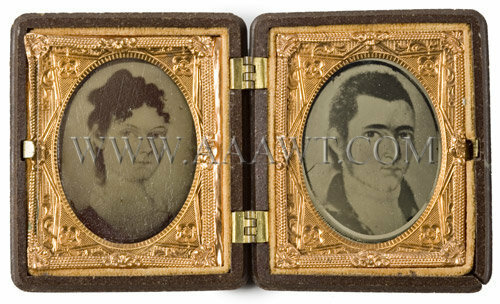 The tintypes are framed together in a hinged, double-sided thermoplastic case. Very good. 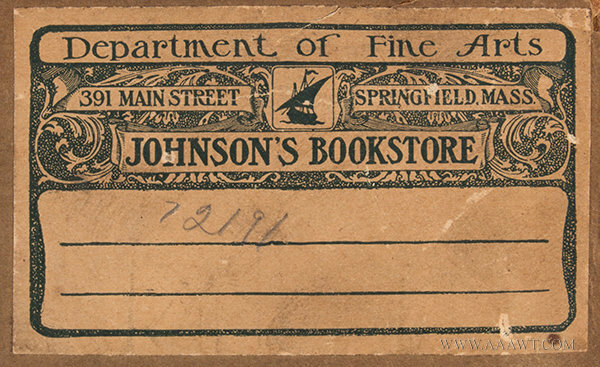 Dimensions of each: 2.5 by 2-inches. 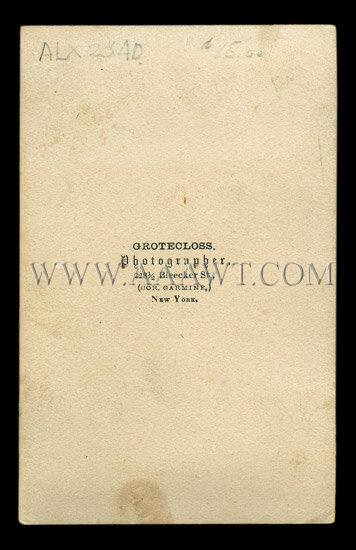 The back has a printed logo of "Grotcloss, Photographer, 228 1/2 Bleecker Street, cor Carmine, New York". Excellent. 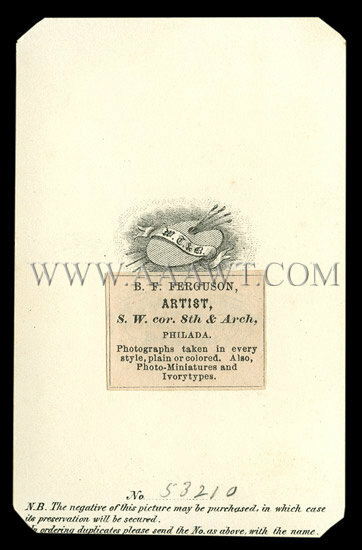 The back is printed with the logo of "B. F. Ferguson, Artist, S. W. Corner 8th & Arch, Philada, Photographs taken in every style, plain or colored. 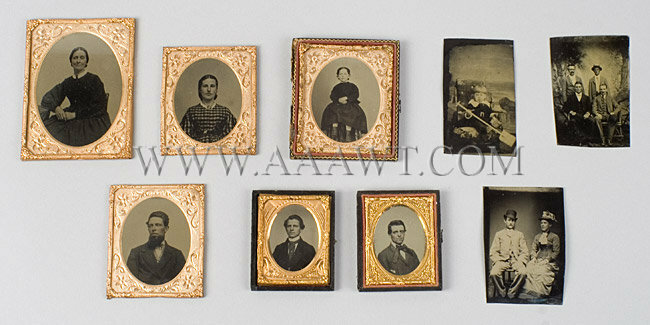 Also photo-miniatures". Clipped corners, otherwise excellent. 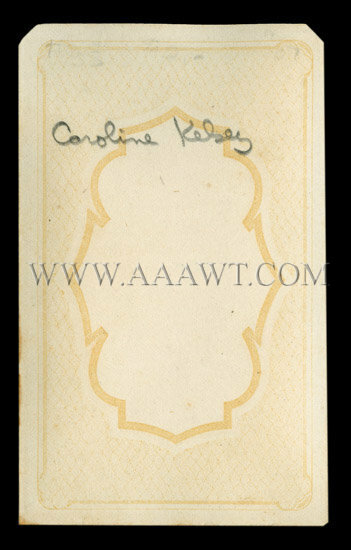 The Carte de viste is inscribed on verso: "Caroline Kelsey". Clipped top corners, otherwise excellent. 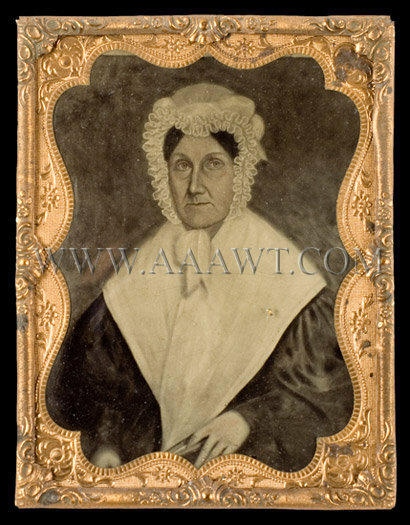 The card is inscribed on verso: "Anna Lindenberger taken from a miniature which was painted in baltimore in 1838, when she was about 53 years of age." Excellent. Dimensions: 2 7/8 by 2 3/8" case. 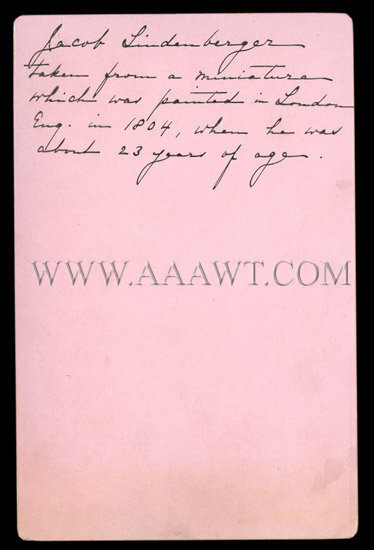 Album of Louisiana Purchase Exposition Photos & Letter Signed by D. R. Lewis, Exposition President, c. 1906 - Collection of 100 photos of the 1904 Louisiana Purchase Exposition, also called the St. Louis World's Fair, in an album presented to the Director and Chairman of the Committee on Sanitation of the Louisiana Purchase Exposition Company, includes pictures of William Howard Taft, then Secretary of War, delivering an address, the presentation letter is signed in pen by D. R. Francis, President of the Louisiana Purchase Exposition Company as well as former Mayor of St. Louis and Governor of Missouri, the letter is faded almost to obscurity and the covers of the album are missing. 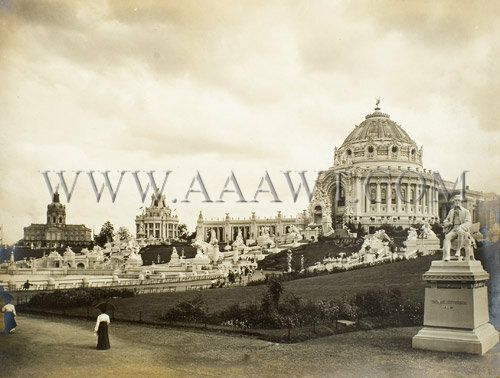 Images not limited to, include Native Americans, foreign peoples, architecture; VIP's, statues, street scenes and animals such as elephants on slides. 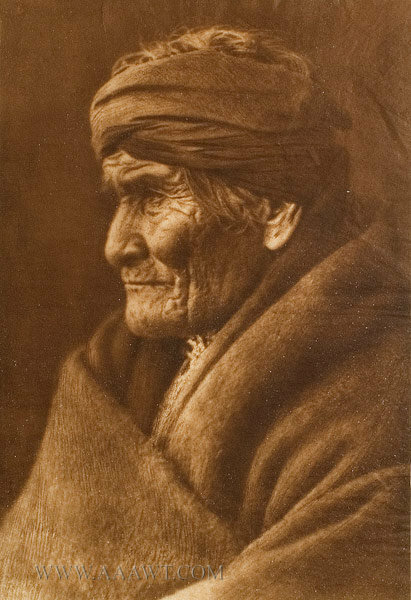 From Wikipedia: "Geronimo - Apache (1905) Description by Edward S. Curtis: This portrait of the historical old Apache was made in March, 1905. 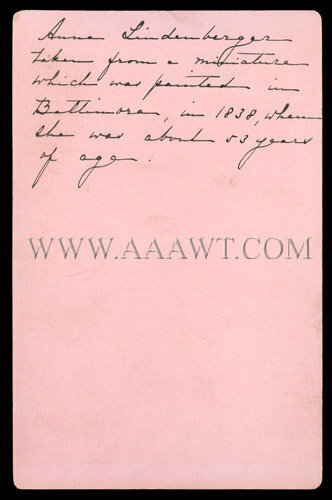 According to Geronimo's calculation he was at the time seventy-six years of age, thus making the year of his birth 1829. 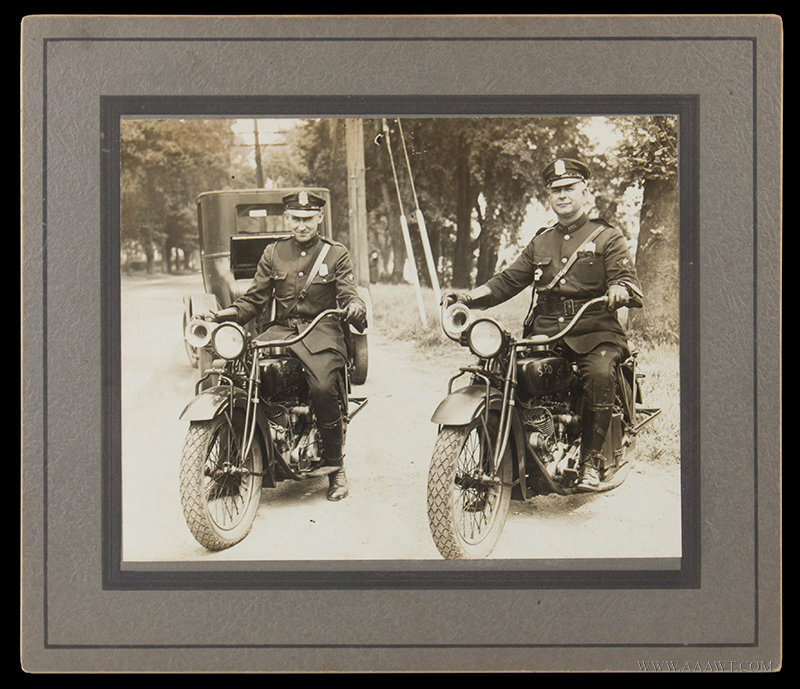 The picture was taken at Carlisle, Pennsylvania, the day before the inauguration of President Roosevelt, Geronimo being one of the warriors who took part in the inaugural parade at Washington. He appreciated the honor of being one of those chosen for this occasion, and the catching of his features while the old warrior was in a retrospective mood was most fortunate." From Wikipedia: "This image came from The North American Indian by Edward S. Curtis. 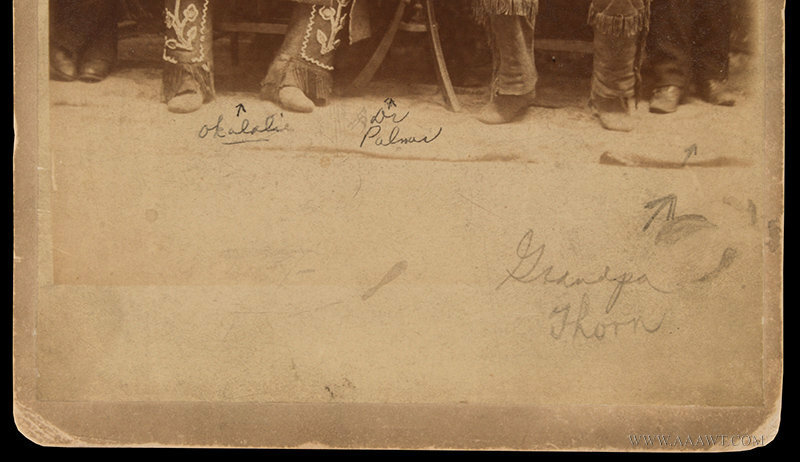 These images were published between 1907 and 1930"
Geronimo-Apache: Frame 23.75 by 18.25 View 16.25 by 10.75 Actual Tissue size: 12" by 17"
Lower Center: "From Copyright Photograph 1907 by E. S. Curtis"
Lower Right: "Photogravure John Andrew and Son"
Exceptional authentic example, possibly one of the overruns on India Proof or Gambi Tissue Paper. 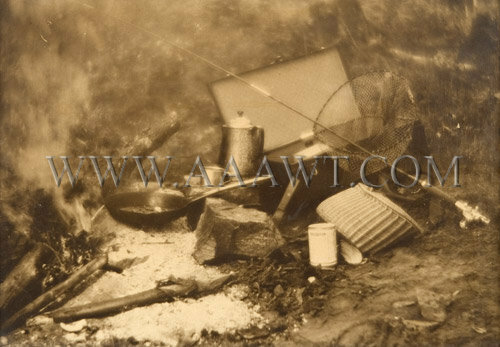 Although this iconic image of Geronimo presents very nicely in the current frame, we would recommend a minor investment in a museum mounting to preserve this image for the generations to come. 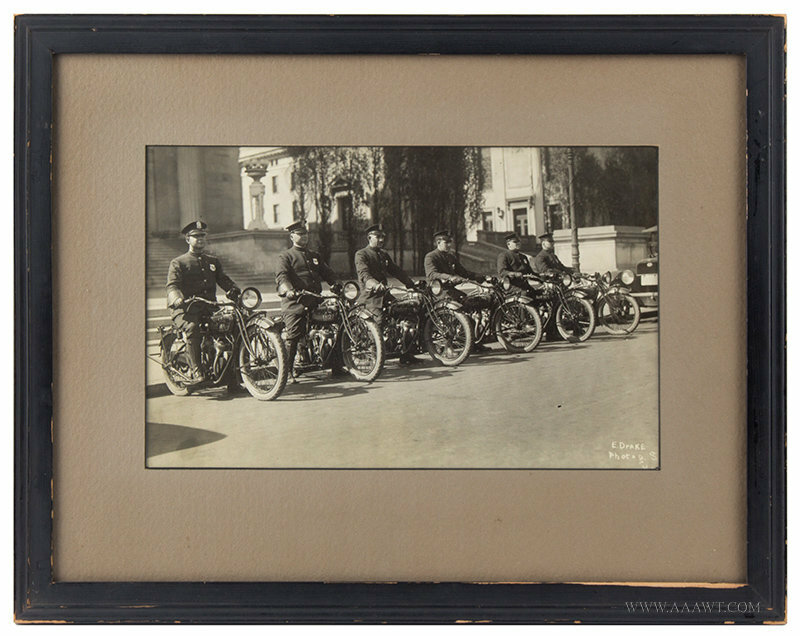 The current owner self mounted the photogravure on acid free using common tape, and there are now very minor paper losses to each corner where the tape remains affixed. 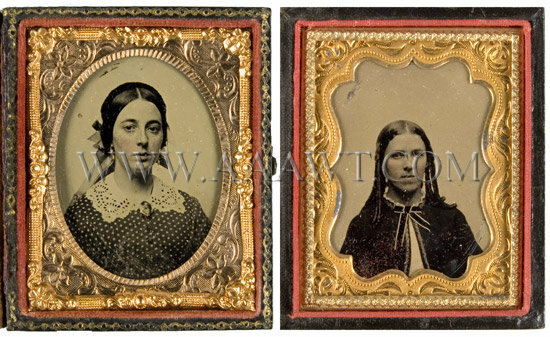 Losses are invisible under matting, and we have obtained an estimate of 300-500 for restoration (details available), plus the cost of appropriate museum quality mat. 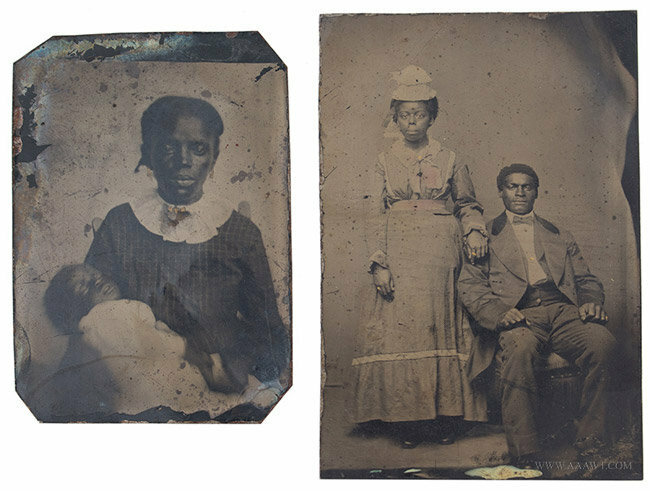 The tintype has no case. Excellent. Union Now & Forever mat on one. Dimensions: range from 2.875 by 2.375-inches to 4.25 by 3.25-inches. Dimensions: 2.875 by 2.375-inch case. The Union soldiers, one wearing an enlisted foot overcoat and identified as Frank Jerome, the other with a Hardee hat that an "8" within the Infantry horn. 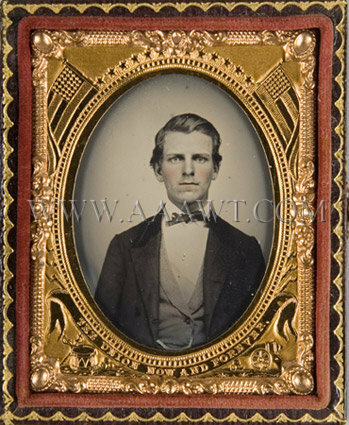 The album, with a stamped leather and gilt cover secured with two brass straps, has numerous CDV's of members of the Jerome family as well as pictures of all four 1884 Presidential and Vice Presidential candidates - Cleveland & Hendricks, Blaine & Logan - clipped from a Quaker Bitters advertisement. 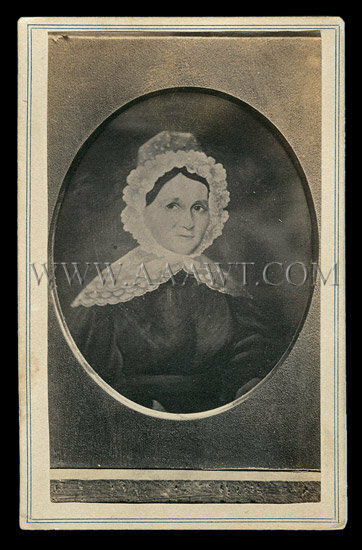 CW CDV's marked Morgan & Bolles, New London, CT on reverse and in very good condition. Album has wear along edges but no splits; pages are solid, latches very good. 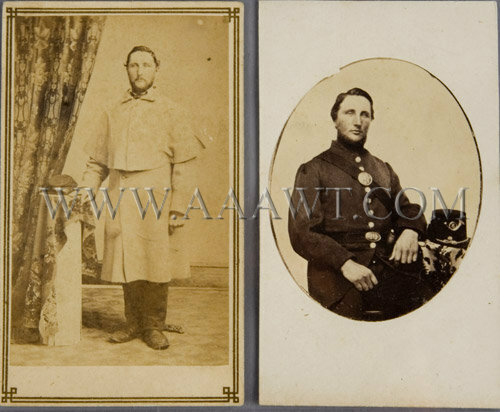 Also, a pair of CDV's depicting two brothers from Waterford, CT. Corporal Albert O. Comstock (1842 - 1863) enlisted into "H" Co., 14th CT Infantry on 7/24/1862. 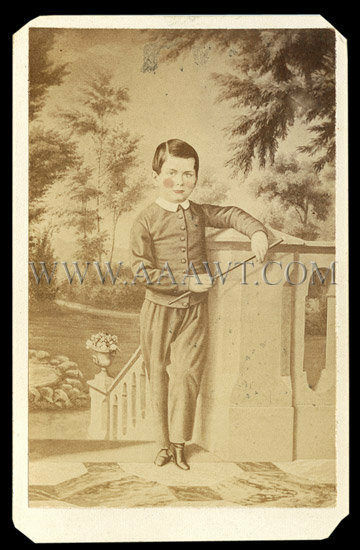 He died of illness on 12/11/1863. He is shown wearing a sack coat and corporal's stripes. 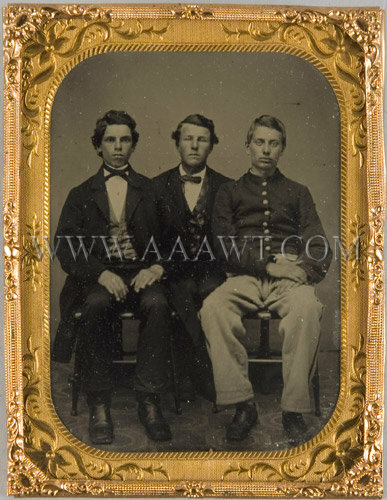 His brother, James was commissioned into "H" Co. 14th CT Infantry as a 2nd Lieutenant on 7/17/1862 and discharged for a disability on 12/14/1862. 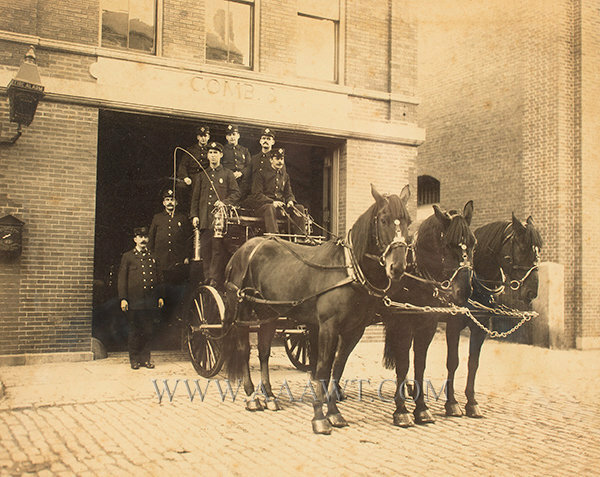 He is wearing an officer's frock coat, sash, and second lieutenant's shoulder straps. 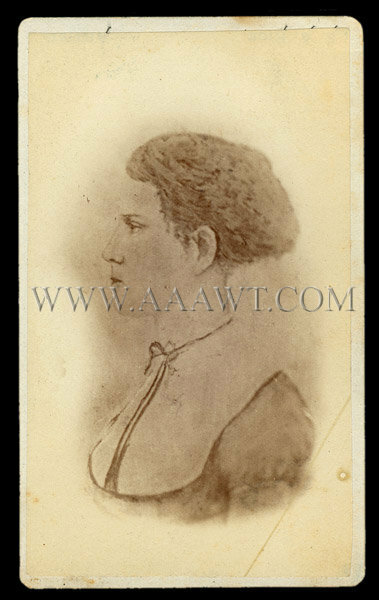 The corners are cut and there is staining on the CDV of Lieutenant Comstock (As depicted). 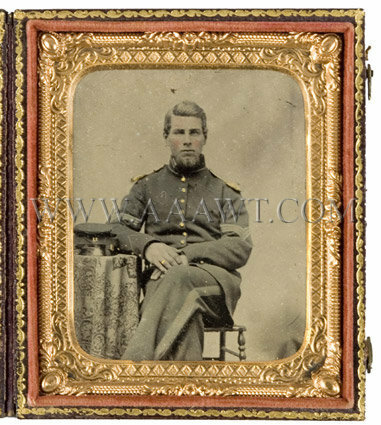 The CDV of Corporal Comstock has light soiling in the upper right; it is signed with back-mark for N.A. 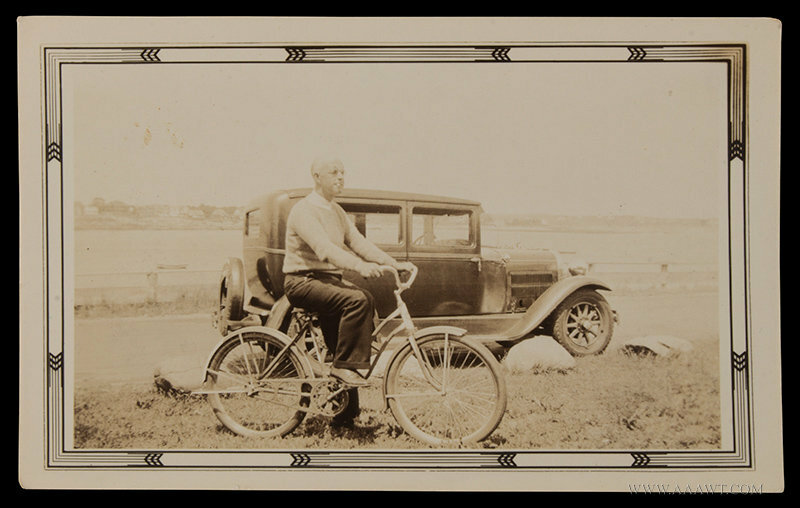 & R.A. Moore, Photographers on the reverse. 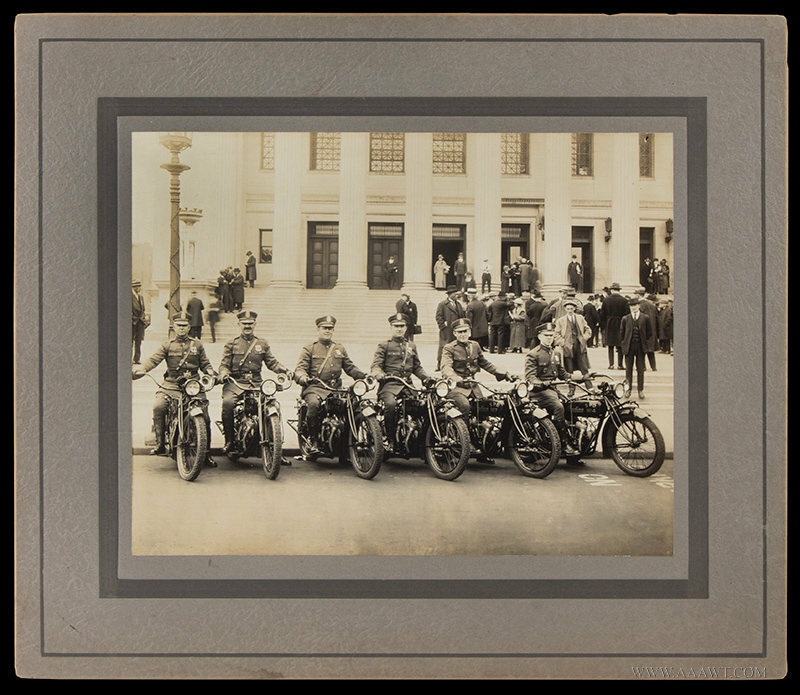 The album contains 49-additional images of the soldiers' relatives. Measures 8.5 by 6 by 2-inches. 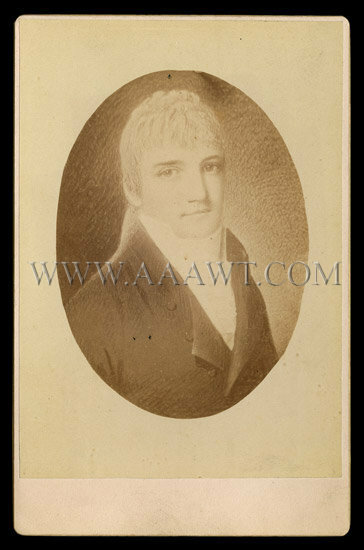 Inscribed on verso of the man: "James Barnes born 1773. 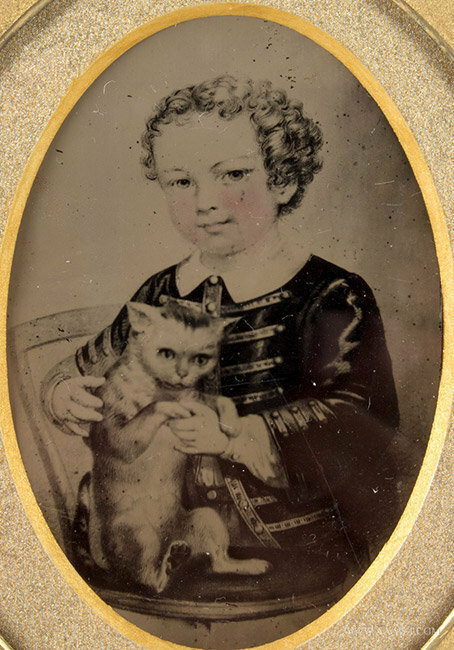 This photograph is a copy of a painting done at his home in Cheshire about 1850. 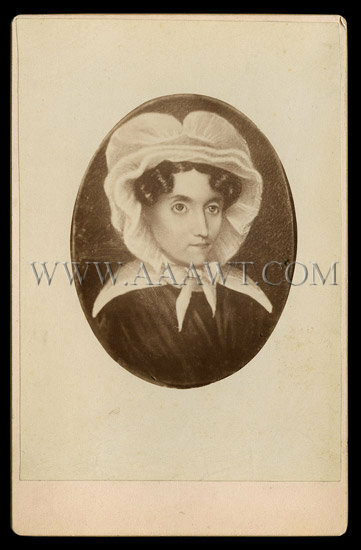 Born Apr 16 1773." 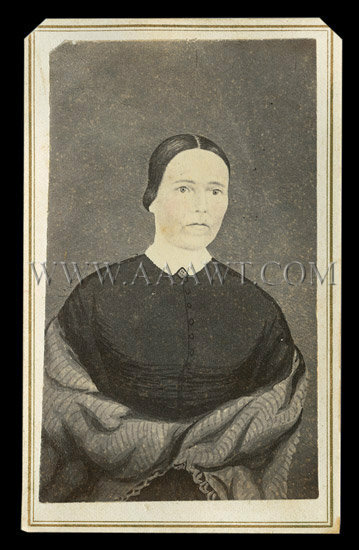 Inscribed on verso of the woman: "Margaret Bell Barnes a photographic copy of a painting done at her home in Cheshire about 1850." 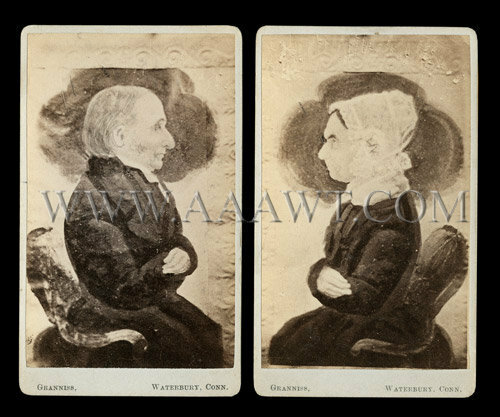 Each is marked at lower margin "Grannis, Waterbury, Conn."
Dimensions of each: 4 by 2.5-inches.